Imagine having access to data that could literally double your blogs conversion rates overnight. Better still, think about how powerful it would be if you could see videos of exactly how people interact (or don’t) with your opt in box, your lead capture page and your shopping cart. How incredible would it be if you could watch videos that give you powerful insight into how your visitors engage with all of your pages, your widgets, your social media buttons etc? If you haven’t heard of Clicktale yet, it’s a online marketers dream come true! Below is how their opt in form looked. As you can see, they had 5 fields to fill in but only 4 out of the 5 had an * indicating they were required fields. Using their own form analytics, they discovered they had a 42.57% conversion rate. Not bad! 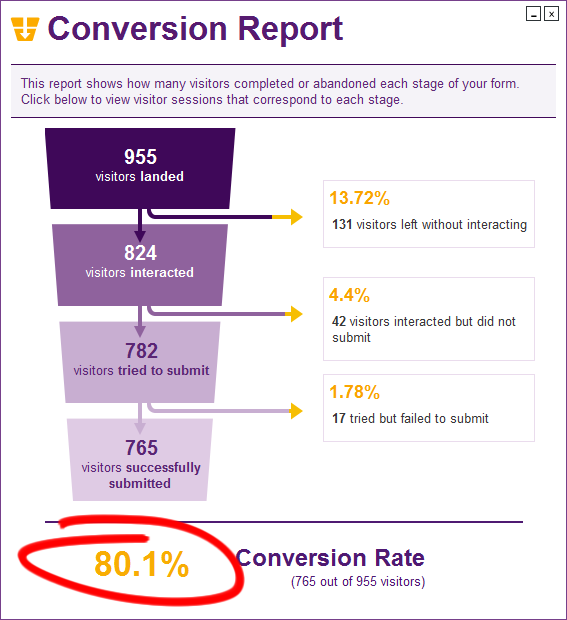 But what they also discovered was that 39% of their visitors started to fill in their opt in form but never completed it. 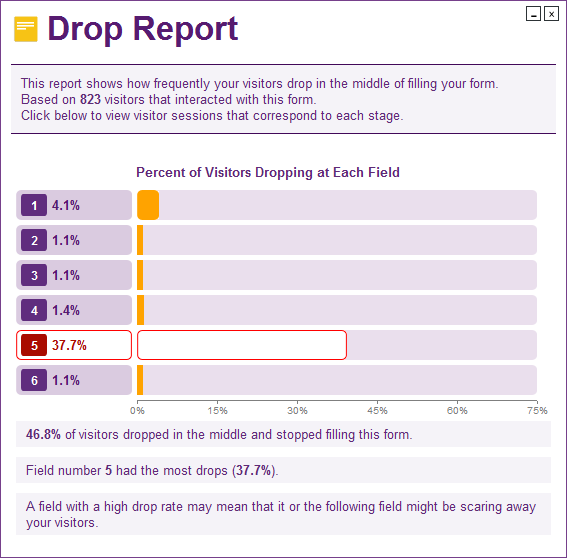 Using their Drop Report, they discovered field number 5 was the problem area with a drop off of 37.7% of visitors. So 37.7% of the 39% were instantly identifiable. The 5th field happened to be the field that asked for the visitors phone number. Now this is extremely powerful insight as it wasn’t a required field! If you think you had it covered by not making all fields on your form a required field, think again. From the studies the gang at Clicktale did, it would indicate that people scan your opt in form and assume that all fields are required unless you tell them they’re not! So what they did was add one word, optional and bang, their conversion rate went from 42.57% to 80.1% overnight! After this change they also found that 66.3% of their visitors chose to leave this field blank. 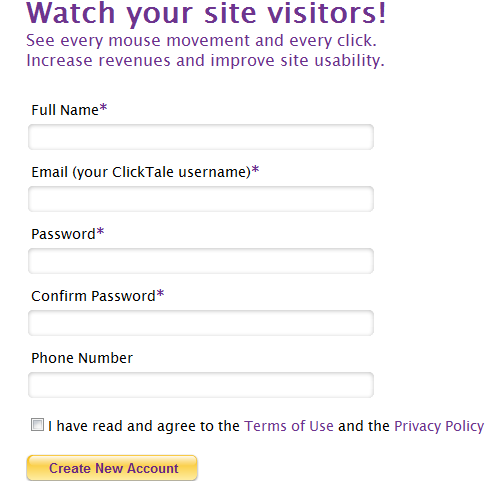 This is a really powerful example of how asking for to much information from your visitors can scare them off. How can Clicktale help improve my blog in general? If you’ve been using Google Analytics, Clicktale compliments this tool beautifully. It’s one thing being able to see data on how people found your site, how long they spent on your site etc but being able to watch videos of how visitors interact when they come to your blog is priceless. If you’ve thought about installing the software on Facebook to watch videos on how your ex engages on other pages, sorry your out of luck! If you want to view the data on https secure forms such as shopping carts, you’ll need the paid version. As the paid version allows tracking for 3 domains, you could partner with 2 others to bring your monthly cost down to $25. So there you have it, an online marketers dream! If you think others can benefit from gaining incredibly powerful insight into how visitors engage on their sites, be sure to tweet them this post. And of course make sure you leave me a comment below and let everyone know about any cutting edge software you’ve been using lately. I have been using clicktale for a long time with my e-commerce stores and absolutely love it! So easy to use, and totally agree with your post, the amount of information it delivers is amazing. It definitely helped me to increase sales in a very short period of time. Also helped to understand the psychology of a buyer, which was super important to me at the time! Thanks for your support and yeah I just squeezed that video in while my laptop was on the edge of blowing up lol! I know that your e-commerce stores were very successful so thanks for letting everyone know that Clicktale was a big help to understanding your buyers. I love that these guys keep evolving their technology. Well, this is a pretty nifty piece of software. I had no idea that something like this even existed. Getting the kind of information this tool provides can really be a huge help. Thanks for sharing this with us. Gotta go head over and get my own account. I haven’t heard that word in a while but yes ‘nifty’ is exactly what it is. I’ll be interested to hear from you in a week or 2 after your new account has some movies in it. Yet another excellent post about the evolution of technology and how it can help us as online marketers improve our conversions. It’s interesting to see how adding or deleting one word can change an opt-in campaign’s conversion rate so dramatically. And knowing how people are actually interacting with your site is indeed powerful feedback! I will definitely check into Clicktale! Thanks! Thank you and yes the technology that’s out there to help us with conversions is just mind boggling! I would love to hear what you think once you have your own account up and running. Thanks for sharing another way to track your visitors. I’ll check this out later. Off to see what I can see! You’re welcome and I can’t wait to hear what you see! Well Michaele, I must say you have come through with a serious tool here that will really help people. I actually sent this video to one of my old clients as there sales conversions are quiet low. I am sure this will help them and me. I really hope it helps your client. If their sales process needs work then Clicktale should be the perfect solution. Let me know how it turns out on your own blog. I actually heard about the tool as part of a course I was doing. Never a day goes by where I’m not totally blown away by the technology that’s out there! You’ve done a terrific job with the video – I told you, you’re a natural at it! I agree with Don that it’s a nifty piece of software! (I love funny little words like that :)). I’ve just opened a free account with them so now I’ll just sit back and wait to see what happens from there! Thanks for sharing this information with us, Michaele. Thank you and yes the computer did sound like chattering teeth or a helicopter about to take off lol. It’s all fixed now so hopefully no more gremlins! I can’t wait to hear what you learn about your visitors from your free account. I would love to hear what you learn once you have it installed. Fantastic work on your blog. I love the header you created and the fantastic demo you did on the awesome graphics tool.